INDIA/CAMEROON, Nov 26 2017 (IPS) - Sally Mboumien remembers the day she pressed a steaming hot stone against her chest. In Bawock, the rural community of western Cameroon where she grew up, young girls often had their young, sprouting breasts flattened with a hot iron or a hammer or spatulas that had been heated over burning coals. This was good for the girls because it would keep them safe from men, she had often heard her elders say. So one day, when her mother had gone to visit relatives, a 11-year-old Mboumien overheated a stone and tried to iron her own breasts. The stone burnt the delicate skin and tissue, leaving deep black scars over her breasts. Her waves of pain were overshadowed with fear. Terrified, the little girl hid her scars from everyone, including her mother. “I did what everyone said was good. But I was only a victim of ignorance,” says Mboumien – now one of Cameroon’s most vocal advocates for Sexual and Reproductive Health and Rights (SRHR) for girls and young women. According to the United Nations, breast ironing or breast flattening affects 3.8 million women around the world, including in Cameroon, Benin, Ivory Coast, Chad, Guinea-Bissau, Kenya, Togo, Zimbabwe and Guinea-Conakry. It is also one of the five most under-reported crimes relating to gender-based violence. Although it is done in an attempt to delay puberty and safeguard the girl from unwanted sexual desire, breast ironing exposes girls to numerous health problems such as infections, cysts, permanent damage of the tissue, cancer and complete disappearance of one or both breasts. Besides which, it’s an utter violation of a girl’s sexual and physical rights and integrity. Coinciding with UN Women’s Orange Campaign – an initiative that generates public awareness for 16 days of activities against gender-based violence from Nov. 25 to Dec. 10 – Mboumien, the Founder of Common Action for Gender Development, a SRHR Advocacy organization, is planning to hit the road. She will be seen doing what she does best: educating people in local communities on the sexual and reproductive rights of girls and women and why it is crucial for society to abandon any practices that violate these rights. 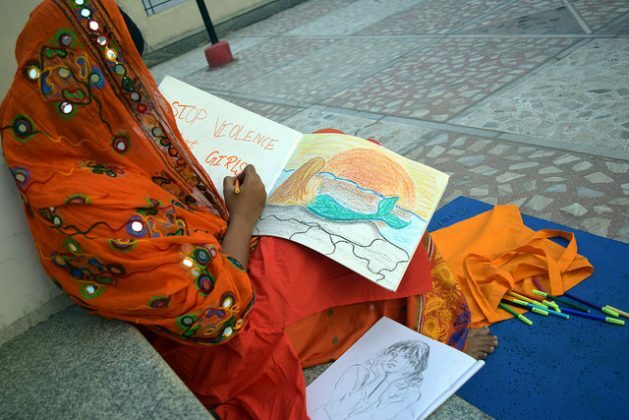 Thousands of miles away from Mboumien, Bharti Singh Chauhan, a girls’ rights activist in India’s Rajasthan state, is also participating in the Orange Campaign. Her plan: watch a movie. In a state where almost 40 percent of all girls are married before 18 years of age and where it is still hard for girls, especially those from marginalized communities, to get an education, watching a film is both a symbolic and an actual move forward. At Praveenlatha Sansthan, a charity Chauhan founded, she is empowering over 100 teenage girls to fight the dual evil of child marriage and illiteracy. All of the girls come from the most marginalized families in the city and witness violence in many forms: child marriage, physical and psychological abuse. The first casualty of this is their education, as the girls drop out of school voluntarily or their parents stop sending them. Chauhan, a fierce advocate for rights to dignity, helps the girls go back to school so that they don’t fall prey to the vicious cycle of illiteracy, poverty, abuse and child marriage. Going out to watch a movie in a theatre is anything but a trivial matter to these girls. In fact, for them, this is a day of living free. “It helps them get out of the four walls within which they live, it helps them feel freedom, forget the daily hardship they experience every day and it also helps them learn something from the movie, especially because we choose the movies that come with a strong social message. Finally, sitting there in the same hall with others help them feel what it is: that they are not lesser than anyone and that they have the same rights as anyone else has,” says Chauhan. The movie the girls will watch this time is Secret Superstar, an Indian film that tells the story of a teenager from a Muslim family who strives to be a rock star but is forbidden by her father to do so. Defiant, the girl posts her own videos on Youtube, fulfilling a dream. The girls, feels Chauhan, will identify with the protagonist of the film as they have many things in common, especially the social, communal, economic and cultural struggles. Like Mboumien and Chauhan, thousands of other women – many of them survivors of gender-based violence – are joining the 16 Days of Orange Campaign across Africa, Asia, the Americas and elsewhere. From sexual assaults, beatings, violations of human rights, violation and denial of health rights, rights to privacy and rights to choose a partner to the right to say no to unwanted pregnancies, women activists are taking to the streets, village halls and city auditoriums to demand an end to gender-based violence. In Toronto, Canada, 68-year-old school teacher Tamarack Verall is also feeling excited about participating in the Orange Campaign. Her plan is to meet indigenous women and talk about their right to a violence-free world. The fact that the campaign has been able to strike a chord with women across the world also proves that GBV is not an academic term, but an ugly reality that women experience globally, regardless of their race, religion, culture, age, language and educational or economic status. Nanette Braun, Communications and Advocacy Chief at UN Women, agrees. “The 16 Days come as we experience a global outcry over sexual harassment and violence. Now it is time for action to end violence against women,” she says. However, activists like Mboumian and Chauhan say feel that these 16 days are not the only time to talk about gender violence. There should be a sustained effort to eradicate gender-based violence in all forms. Chauhan says fighting violence is a 24-hour a day, 365-day a year job, and one must have empathy even while opposing a social evil. “If I only say child marriage must end, I am not doing the complete job. It will stop the girl from getting married early. But to end the cycle of violence, she must also be sent to a school, and provided the freedom she needs to pursue a goal and allowed the dignity she deserves to live a happy, normal life,” says the activist, who has been given an award for her work by the office of the President of India. Mboumien adds that social campaigns launched by Western countries often fail to understand the local history of a violent practice and the ethos attached to it. This, she feels, limits the campaign’s impacts as men start viewing women who condemn violence as rebellious and acting superior to them. Violence, she says, needs to be understood in its local context. Men need to be involved. People need to be assured that a campaign is trying not to rob them of their tradition, but to save it from becoming a tool that destabilizes the entire society. With her favorite slogan “Don’t condemn us, educate us” Mboumien tries to spread knowledge about how gender-based violence not only harms a specific gender but weakens the cultural fabric of the enite society and prevents it from becoming progressive. “I don’t believe in condemnation. Condemning a community or a people for a cultural practice is not the right way to rid it. What we need is make people understand why it is bad, what harm it actually causes and seek their cooperation to end this harmful practice,” she says.